one last look back at the decade i spent with the magazines. i did love them all, and working with the talented, passionate creators behind them. i got particularly excited when wish magazine (sadly, now defunct) came out each month, because it had an extensive food section. this recipe is from the cookbook spinoff from wish. having tried my share of them with great success every time, i’m willing to say every recipe in this book is a winner. it’s no longer for sale, but the recipes are still available online. 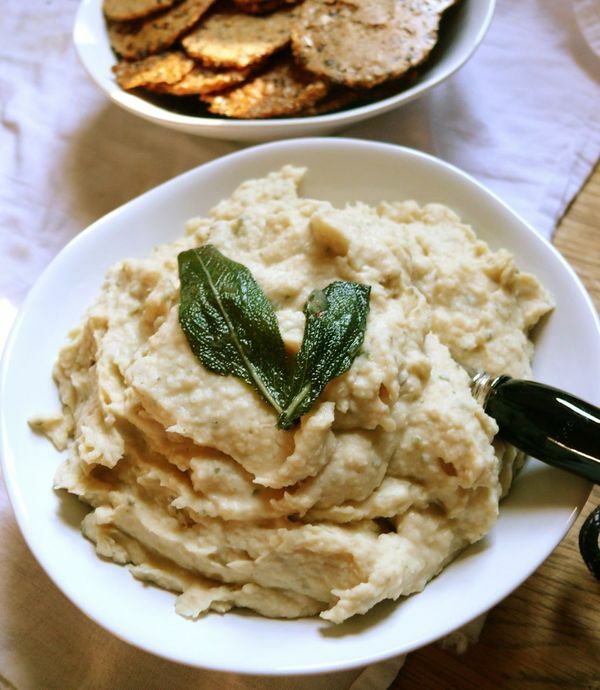 i can’t tell you how many times i’ve whipped up this white bean purée to take to a party or potluck. it comes together in minutes and seems to please everybody. i even made it last weekend for an al fresco dinner that i hosted in our backyard, and omitted the garlic since one of my guests doesn’t digest it well. it still tasted amazing and drew approving comments from every single guest–including a discerning 13-month-old baby. i served it alongside very hearty crackers instead of on toasts which the original recipe calls for. i think it’s also a great dip for just about anything, and i can even imagine it thinned out over pasta. so i’ve gone from drooling over recipes to writing my own. i only hope mine are this good. Add shallots and garlic and cook until soft. Add white beans and mix thoroughly. Transfer mixture to a food processor. Add sage leaves, lemon juice, salt and extra virgin olive oil. Purée until smooth. Oh gosh… this looks amazing! I’m newly mostly vegetarian again (long horrible story involving surgeries and life with no stomach) and I’m desperately seeking out any and all yummy bean recipes. This one so fits the bill! I can’t thank you enough! i hope you find them useful and that youre well! This looks amazing, and what a great alternative to hummus. My husband is a diabetic and I am always looking for healthy snacks that don’t taste like diet food! thanks, deborah! i hope you try it–zero guilt and so tasty. I’ve made this before and it was delish! Planning to make it for a party tonight, but I don’t have sage — how do you think it would be with fresh rosemary? Ooops, I’m probably too late! Hope it worked out well with the rosemary? I would use a little less because I find it to be stronger than sage but I think it would be delicious.